Has Slain Israeli Peacemaker Yitzhak Rabin been denied his Legacy? On November 4 1995, Yitzhak Rabin, the prime minister of Israel, was murdered by Yigal Amir, an extremist religious Jew opposed to his peace deals with the Palestinians. 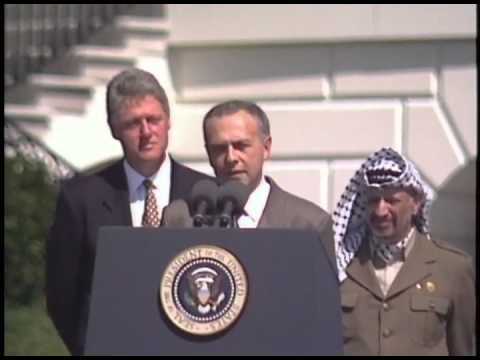 The Oslo process, which culminated with the awkward handshake between Rabin and Yasser Arafat on the White House lawn in September 1993, established limited self-rule for Palestinians and entailed an Israeli redeployment from the West Bank, territory that Amir believed to be the biblical birthright of the Jewish people. It’s common to contend that Rabin’s murder also killed the peace process. But given Rabin’s willingness to change course depending on the circumstances, there is no way to know whether he would have continued with the concessions agreed in the Oslo accords. So, 20 years on, how to assess Rabin’s legacy? Rabin knew that by the 1990s, Israel was more secure than it had ever been since its establishment in 1948. By the time he became prime minister (for the second time) in 1992, Israel had a peace treaty with Egypt and a close alliance with the United States. It was the strongest military power in the region, with the most advanced weapons systems and a powerful domestic arms industry, while its most vociferous enemies – Iraq and the Palestine Liberation Organization – had either been defeated (Iraq in the First Gulf War) or were at the nadir of their influence and appeal (the PLO at the end of the First Intifada). It was also in the early 1990s that the country established diplomatic relations with key states in the world, including Russia, China and India. Israel could, Rabin felt, afford a peace process with the Palestinians. That realism also led Rabin to the belief that a Palestinian state was inevitable as a result of Oslo, as he told his close aide Eitan Haber (who in turn told me during an interview). Rabin didn’t like or trust Palestinian leader Yasser Arafat, and it’s not clear whether he had a sense of what such a state would look like. But he knew ruling over another people was no longer viable. And he was already thinking about Iran as the primary strategic threat to the country. At the same time, however, Rabin was capable of using brute force when he deemed it necessary. Rabin’s “break their bones” instructions regarding Palestinian protesters and rioters in the First Intifada helped legitimize a harsh Israeli response to civilian rallies against the occupation. He used deportation and border closures as he thought necessary. In other words, he did not hesitate to use force and coercion. But he was, at the same time, willing to innovate for the sake of Israeli security, and to adopt nonmilitary means as well. It’s become a cliché to talk of “risks for peace,” and Rabin used similar language in defending Oslo. But Rabin didn’t see things as gambles. As a military man, he saw issues as having best solutions, which might still fail. But it was important to try. Almost all of Israel’s leaders have dismissed this part of his legacy – his willingness to take risks. Even those on the left and in the center worry that the Israeli public doesn’t want to hear about an end to the occupation while Palestinian terrorism continues. Unlike Rabin, they have been unwilling to confront public opinion on the matter. There is another important issue of Yitzhak Rabin’s time in office that has been eclipsed in the past 20 years. Rabin’s second tenure as prime minister is known as the “golden era” of Jewish-Arab relations in Israel. Rabin paid more attention to Arab citizens of Israel, about 20% of the population, than any other Jewish Israeli leader had before or has since. In addition to directing more resources to the community, he responded to their concerns by dropping the traditional paternalistic attitude the Zionist parties had long held regarding the Arab minority. Perhaps more importantly, for the first and only time, Arab political parties played an indirect role in policymaking. In 1993, as a result of the Oslo accords, Rabin lost his majority in the Knesset, the Israeli parliament. Two Arab parties propped him up from outside his own coalition, voting with the government on no-confidence measures brought by the opposition. Rabin’s views on Israel’s Arab minority reflected his analysis of Israeli-Palestinian relations more broadly – namely, that coercion was simply untenable as a solution to Israel’s relations with Palestinians inside and outside of Israel. Since 1995, Arab citizens have either disengaged from the political process or voted for Arab parties in increasing numbers, at the expense of Rabin’s party, Labor. The percentage of Arab citizens’ votes for the top three Arab parties, for example, has climbed from 68.7% in 1999 to 80% in 2015. At the same time, a new generation of Arab leaders has adopted a more confrontational approach, most notable in their rhetoric. In addition to calls for the Arab community to be recognized as a national minority that would give the equal status to the Jewish community, some Arab politicians have also cast Jewish Israelis as among the evildoers of the world. Knesset member Haneen Zoabi, for example, has compared the Israeli military to the Islamic State. Not surprisingly, this caused the Zionist parties to view the Arab parties with suspicion and hostility. It’s difficult, then, to speak clearly about Rabin’s legacy because of changed domestic and regional conditions, only some of which are related to the Oslo process that Rabin promoted. But I would argue that he should be remembered for trying – for understanding that Israel needed to change, to focus on achieving domestic harmony and an accepted place in the Middle East. The right in Israel, by contrast, views the recent wave of violence as simply the latest outburst of anti-Jewish activity and threat that stretches back to the Roman age. Rabin also proposed serious ideas for how to scale down the occupation, even in the face of domestic opposition. The left in Israel forgets this, and tends to react to public opinion rather than try to shape it with bold policies. Rabin’s was a gritty peace, requiring constant effort to fend off challenges. It was not the “clean” version many expect today – that the occupation will be easy to end, that Palestinian hostility will cease once Israel withdraws from the West Bank, that Israel’s security concerns are exaggerated. That he pushed forward in the face of these challenges makes Rabin a peacemaker in the true sense of the word.